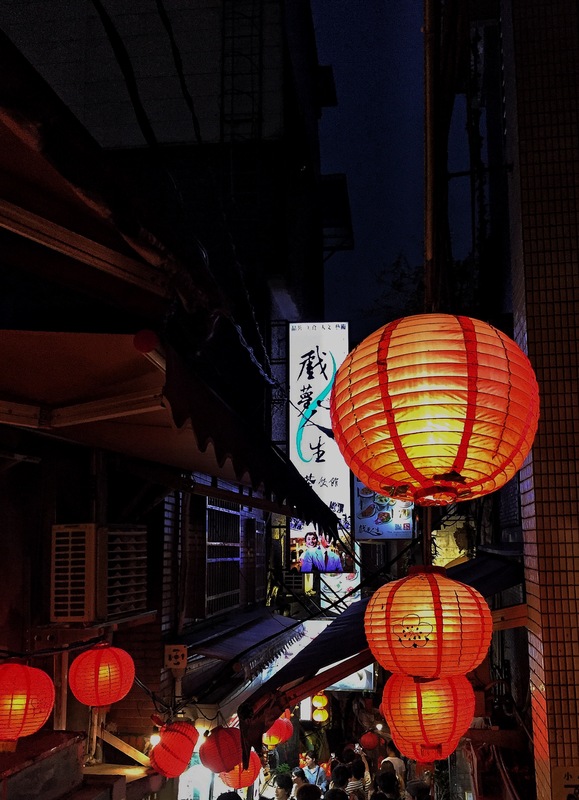 A sharp contrast from the busy metropolis of Taipei, Jiufen offers a taste of Taiwan in years gone by despite it only being 20 miles outside of the centre of city. A short, cheap bus ride makes it the ultimate destination for a day trip from Taipei. We caught the 1062 bus from a stop nearby to Zhongxiao Fuxing MRT station. There are an abundance of taxis who will offer you trips to Jiufen but despite being reasonably priced they are twice the price of the bus (you pay per person) and will usually wait until the taxi is full before departing. The bus takes around an hour and as with all the buses is a really comfortable air conditioned ride. 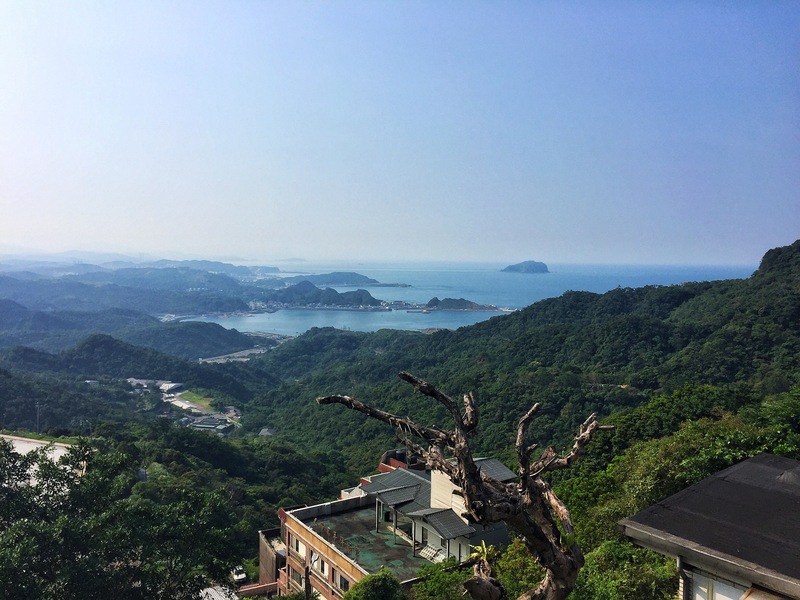 Upon arriving in Jiufen, all eyes are fixated on one thing… THAT coastline. Jiufen is located on a beautiful little hillside and the view down to the shore below and the rugged formation is mesmerising. 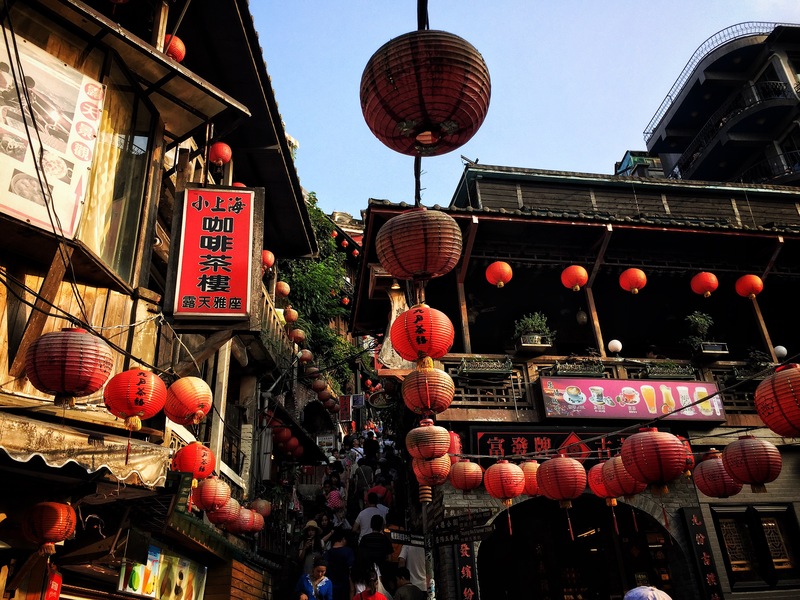 A short walk leads you to the main attraction of Jiufen; an undercover alley filled with souvenirs and culinary treats. 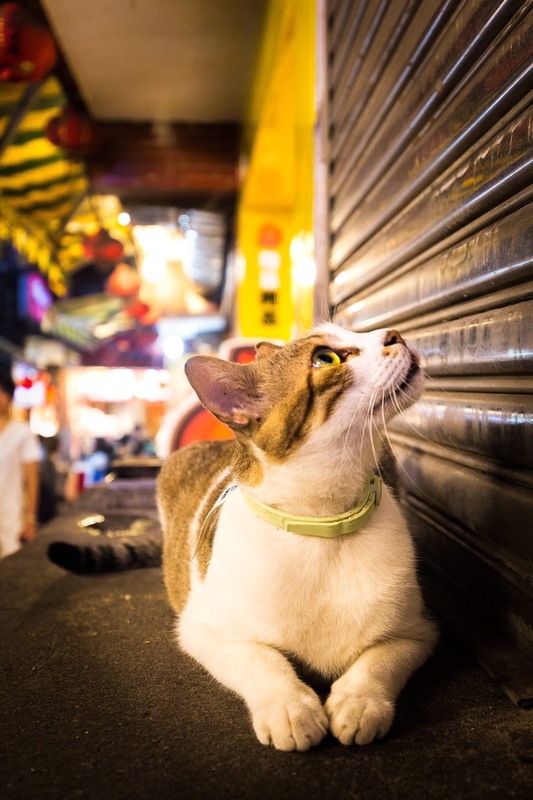 As you navigate your way through the tunnels, watch out for the abundance of beautiful cats that rule the streets. My favourite was this one with a note on his collar asking visitors not to touch, what a diva! This excellent photo was of course taken by Conor. An intersection leads you to the most famous (and probably the steepest!) part of Jiufen; Jiufen Old Street. Lanterns adorn the space above your head and people saunter past soaking up the relaxed atmosphere. On the right is a ‘cave’ tunnel, which if followed to the end leads you onto a view point with an excellent panorama of the coast… and one of the quietest parts of the town! 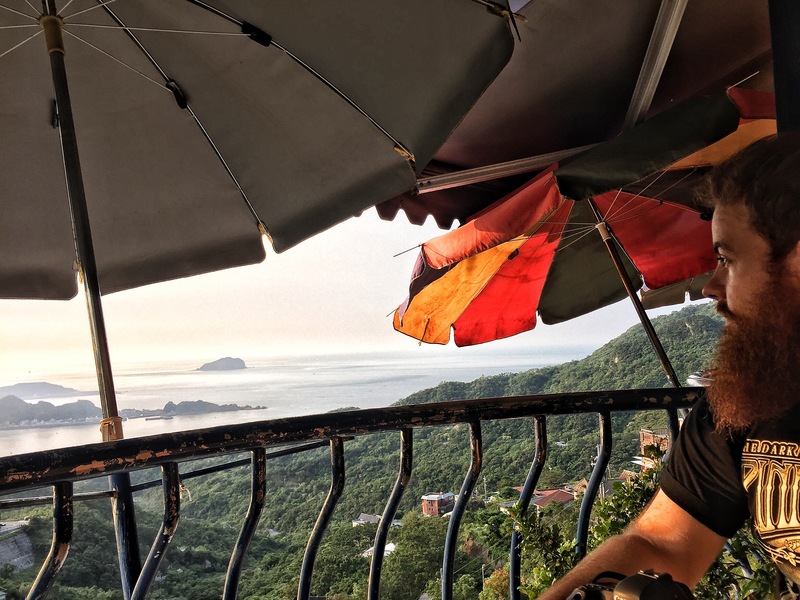 The main things to do in Jiufen are eat, drink tea and relax so we opted for the latter two by choosing a lovely little cafe with the most unbelievable view of the shore. Many of the cafes charge a minimum of 200NTD (£5) per item due to their excellent location but if you walk a little further away from the shopping street there are cheaper alternatives. I had a particularly delicious ginger tea overlooking this view! ﻿Most visitors wait around for one thing… the sunset. All the view points become so busy at sunset! If you’re hoping for a romantic place to watch the sun go down this is not it. 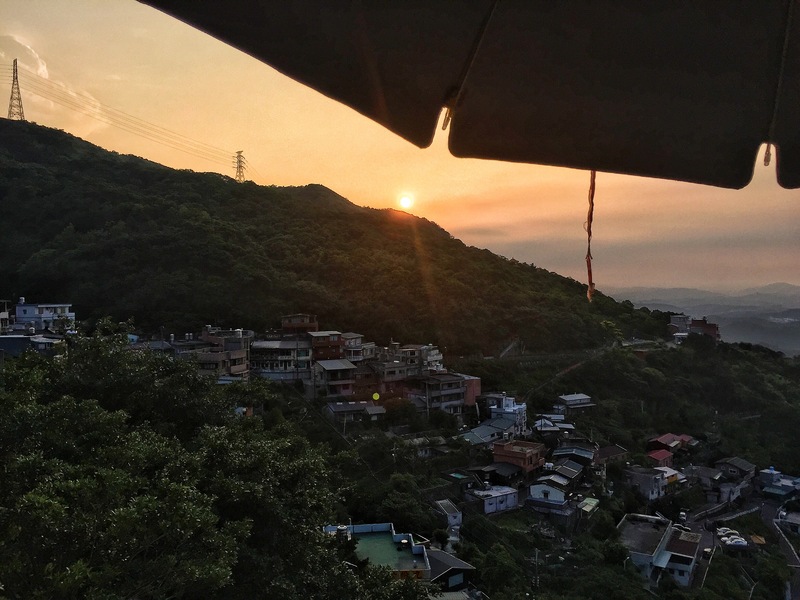 However the sun does look beautiful as it sets behind the mountain, bathing Jiufen in that soft post- sunset glow. In darkness, the lanterns are lit and Jiufen looks even prettier. Looking away from the market streets, the colourful houses on the hillside look beautiful lit up. Equally, bright lights scattered along the shore to warn boats are a great sight to see. Around about 7pm we took a bus back to Taipei. The queue was huge and Conor talked about getting a taxi but the lines move quickly and buses are frequent. Again taxis only leave when they are full and they are often packed tightly with people… no thank you! Keelung mountain also looks beautiful and is said to be an easy 1-2 hour climb from Jiufen but as I had been ill for a few days we decided to give it a miss as my energy was severely lacking. We would however love to climb it if we ever get the chance to return. Taiwan’s excellent public transport means that it’s really easy to take a day trip to many places on the island and in our case it was always hassle free! This was our last real bit of adventuring in Taiwan and we’re so glad we managed to visit Jiufen. I still have a few Taiwanese destinations that I need to write about and I can’t wait to share them with you. As always, thank you so much for reading and please ask any questions! Brilliant as always Emma, makes me feel like I was there too! !